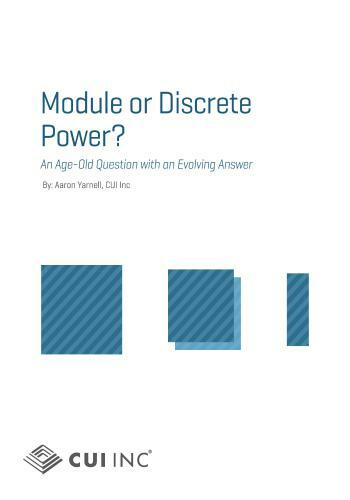 Module or Discrete Power ? To be fair, pre-designed modules will almost always be more expensive than discrete implementations when looking strictly at a bill of materials. This is why many organizations developing high volume applications push their design teams toward this solution. Depending on factors such as target BOM cost, application requirements, and in-house capabilities, a discrete solution may very well be the ideal ft. However, when analyzing the cost of a design it is imperative to consider all of the associated resources, including design time, simulation time and tools, layout time, host PCB requirements, evaluation time and capital equipment costs in addition to BOM cost alone. For many companies, when projects are analyzed from this higher level, the use of ready-made power modules enables projects to be delivered to production in a shorter amount of time, with less risk, fewer worries and lower overall project costs. They may not be the answer for every application, but for the reasons mentioned above, power modules continue to gain favor in an increasing number of designs.